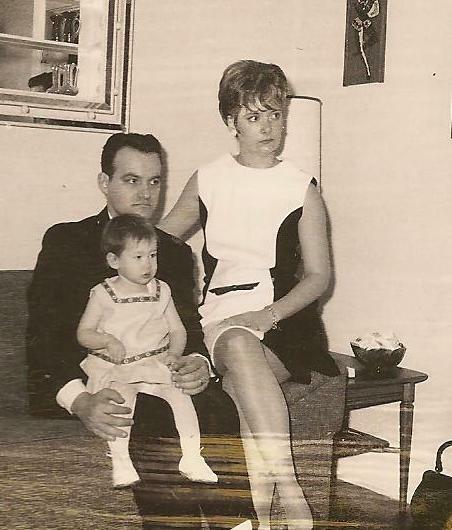 Dad, Mom and me, 1968. I received a lovely note in my inbox last week: Judy, a friend from my school days, used my story in talking with her 12-year-old adopted daughter Mollie. It seems friends at camp were shocked to discover Mollie isn’t interested in searching for her birth parents. Judy told Mollie that she has Judy’s blessing if she should ever decide to search. She added that Mollie might not want to search now, but she may later, and then she told Mollie about me. When I was Mollie’s age, searching was the furthest thing from my mind. I was loved. I had been Chosen. My parents never made a secret about my adoption, and always said they would support me if I chose to search. True to their word, they are the biggest cheerleaders of my current search for my birth mother, Patricia Clark. But I didn’t feel a need to search back then. If we had a geneaology assignment at school, I easily substituted the roots of my adoptive parents — never mind that one look at me erased any doubt that I might be Italian like my dad. After months of being screened, including having people go through their finances and make home visits, my parents learned they would get me. Their road to parenthood had been long and full of pain and disappointment. Here, finally, was a chance to celebrate. So they went out for dinner. And got so rip-roaring drunk that by the end of the night they had invited the band to sit with them and were buying the musicians drinks. Somehow they drove home (eek!) and woke up the entire neighborhood as they made their way from the car to their apartment. The light of day was a real killjoy. Sick and hungover, my father somehow made it to work. And then slept in the back of his car in the parking lot. My mother got through the day one-half teaspoon of tea at a time. None of that came to pass. They brought me home and I completed the family they so desperately wanted. As a kid, my story was exotic. If there were other kids at school who were adopted, I wasn’t aware of it. And besides, we were too busy jumping rope, playing with our Barbies and riding our bikes to focus on much else. As I became a teen, that began to change. All adolescents struggle to fit in, and while I could behave like one of the crowd, I always felt a little like a pink elephant in the middle of the room. I regularly made a fool of myself around boys, and never seemed to master group dynamics. Whether my behavior was hard-wired or the result of being adopted, I may never know. New York State had sealed my adoption record and those of thousands of others in an effort to protect us and maintain the privacy of our birth parents — at least that’s the party line. My parents had been told I was the product of a romance by unmarried teenagers. And I had a typewritten report from a foster mother who’d cared for me before I was given to my parents, detailing my eating and sleeping habits, bath time, etc. I always thought of that document as my Paddington Bear instructions, and although cute it was precious little information. It would be 40+ years before I finally got a glimpse at some of my true background, and it still blows my mind to begin to know some of the many things most folks take for granted. I’ll cover that in a future post. Meanwhile, I’m glad Judy used my story in talking with Mollie, and I hope that should Mollie someday decide to search, she’ll find that the laws are finally on her side. I was recently at the wedding of my birth father (his first wife died 7 years ago) and someone said to me “Oh, you must be the love-child”. Looking forward to your next episode, sweet girl of the late 60’s. Thank you, Claire! I never think of myself that way, but I guess I am a love-child after all. Thanks for reading! Very well said. I am an adoptee as well and will be writing a blog on my search and struggles thru it all. Thanks for reading; I look forward to reading your insights, too. So close to home for me Terri! It was also for many years the furthest thing from my mind. I’m glad that she shared your story with her daughter. We can only hope that there are other adoptive parents out there who do the same.